Take a class or join a Chicago-land Anger Management Group! Or get certified as an Anger Management Specialist with the National Anger Management Association. The Institute also offers a Faith-based edition of the book, workbook, DVD and a Christian Curriculum for churches, Christian leaders and organizations desiring a biblical approach. Anger Management Trainer-Specialist online program: Leaders and professionals can get the National Anger Management Association (NAMA) credential through home-study courses: Anger Management Trainer-Specialist Online Certification program provides: videos of workshops online and ability to obtain certification quickly! Includes book, downloadable Trainer's manual, online book/manual lessons, leader's guide, evidence-based treatment planning for anger control problems. Approved by NAMA for the Certified Anger Management Specialist-I or II credential! Online program now approved for 12 CEs by NBCC and NAADAC; 12 CEUs by IAODAPCA; 13 CEUs by NAMA. Or take the Home-study DVD training program: includes training manual, guides, DVDs, power point tools for groups, treatment planning for anger control problems. CEUs provided: NBCC/NAADAC/NAMA/IAODAPCA. Read the latest news and updates on the Anger Management Institute Blog! Need to learn how to manage anger? Order books, courses, coaching, counseling & curriculum now. Are you in need of an Anger Management Program? These distance-learning courses can be used for court-orders, employer, mediation or school mandates. What’s Good About Anger? emphasizes effective and practical skills for managing anger, enhancing relationships and putting your anger to work for good! Discounted prices! Order online here. Steve Yeschek, LCSW, CAMS-IV: Vice-President, Director of Anger Coaching, Consulting, Training & Mediation. What is an Anger Management Specialist? FAQs about the National Anger Management Association Membership and Credentials! Evidence-based Summary. Approvals and benefits. The Anger Management Institute programs and resources are based on the seminars Lynette Hoy began presenting in 1998 to groups and counselors. Lynette Hoy, NCC, LCPC, CAMS-V and Ted Griffin, Editor/writer, co-authored all four editions of the book. The premise of the books, DVDs and courses demonstrate that anger – though often destructive – is a normal emotion and energy which can be transformed into effective behaviors achieving healthy personal and relationship goals. The second, third and fourth editions of the book expand into research based skills, expand on emotional intelligence, include the art of apology and are geared for a general audience and community groups. Since 2008 students/clients in classes and groups held in Oak Brook and Cary, Illinois have been participating in outcome studies which demonstrate the curriculum is evidence-based. The Anger Management Institute is an extension of CounselCare Connection, P.C. and the training company of co-founders: Lynette J. Hoy, NCC, LCPC, and Steve Yeschek, LCSW. This model of anger management is described and widely distributed over the Internet in various newsletter and other online publications and has been extremely well received by hundreds of local, national and international anger management participants. It is currently being used by self-referred clients, court-referred clients, HR referrals, corporate executives, physicians, law enforcement, and others needing qualified anger management services. Lynette Hoy, NCC, LCPC, CAMS-V, Steve Yeschek, LCSW, CAMS-IV have presented various anger management workshops, training and classes since 2004. Lynette and Steve provide Anger Management Trainer-Specialist conferences and workshops which are offered throughout the year providing CEUs/CEs for leaders and professionals. Our staff agree to abide by the NAMA and AACC ethical codes. What is the Anger Management Institute and CounselCare Connection’s Mission? We are committed to honoring God and meeting the needs of people who may be in personal, emotional, mental or relational crisis. We want to provide guidance and resources to help those who are struggling with anger, depression, anxiety, stress, addictions, abuse, grief, marriage, family, relationship or spiritual issues. As a licensed, clinical, professional counseling practice, we encourage people to consider healthy options for change and to decide how to change. We help people identify problems and find the spiritual and practical resources which will make life more manageable, and facilitate the healing process. In offering clinical, educational and coaching services, we’re committed to a practice that explores the needs that people find most pressing. While one of our specialties is Christian counseling for those seeking that emphasis — we strive to serve people from all backgrounds and beliefs. We are dedicated to helping those who desire to grow in their faith while at the same time respecting the spiritual questions and beliefs each person holds. Approved and endorsed program by National Anger Management Association – qualifying certified trainers as Anger Management Specialist-I or II. The Anger Management Institute provides NBCC CE hours, ACEP #6577 (National Board for Certified Counselors) for LPCs, LCPCs. 2-day workshops= 12 CE hours. Online & Home-study DVD courses provide for NBCC CE hours, and IAODAPCA CEUs. Approved by National Association of Social Workers for 12 CEUs for LSWs, LCSWs: #886526264. Approved by NAADAC (association for addictions professionals) for 12 CEUs. Approved by IAODAPCA for 13 CEUs – program # 14282 and home-study programs for 12 CEUs – program # 10719 for: Counselor II, Prevention II, Assessor II, MISA I or II, CCJP II, PCGC II, CAAP II, CRSS I or II,, MAATP II, CFPP II, CADC, CRADC, CSADC, CAADC. Approved by Ohio Counselor, Social Worker & Marriage & Family Therapist Board for 12 CPEs: Provider #MCST081107. Approval nationally by courts and judges for court-mandated cases since 2005. Approved by Cook County District Court and other Chicago-land area courts for court mandated clients. Listed on the National Anger Management Association directory. Listed in the California Evidence-Based Clearinghouse for Child Welfare. Step One — Preparing for Provocation – developing Self-Awareness by identifying, preventing and decreasing triggers for anger. Step Two — Behavioral Changes – developing Self-Management through application of these skills: Time-out, Assertiveness, Stress Management. Step Three — Cognitive Changes – developing Self-Management & Self-motivation through understanding and transforming the emotion of anger into a positive force for change; healthy self-talk and thinking. Step Four —- Relational Changes – enhancing Relational Development through conflict management, forgiveness and emotional intelligence (empathy) skills. The NAS-PI assesses individuals in five categories: Cognition, Arousal, Behavior, Anger Regulation, and Provocation Inventory Score (PI). The participants’ scores for Cognition, Arousal, Behavior, Anger Regulation, and PI-Total T Scores were compared and analyzed for correlations. The pretest and posttest scores for each participant were analyzed to determine whether they had improved in the five categories after receiving anger management training. The scores of seventy-five percent (75%) of the participants improved in each category after they completed the anger management training. Twenty five percent (25%) of the participants’ scores showed no improvement after the completion of the anger management training. The findings might suggest that twenty five percent (25%) of the participants became defensive (which is possible when an individual is mandated to take anger management training), or took a distorted approach when giving responses on the NAS-PI posttest. The data analysis of the 28 individuals suggest that anger management training positively affects psychological functioning and physical health. Although care should be exercised when interpreting results from a small sample size, the outcome data from this analysis is encouraging with regards to the positive results garnered from using the “What’s Good About Anger?” program as an evidence-based approach for anger management. Mrs. Hoy is the President of the Anger Management Institute. Lynette is a National Certified Counselor, a Licensed Clinical Professional Counselor in the State of Illinois. Lynette is a Diplomate, Supervisor, Consultant & Anger Management Specialist-V with the National Anger Management Association. She was recently awarded a Lifetime Achievement Award by NAMA for her contributions, outstanding service and ethical practice in the area of anger management. Lynette is a regular pre-conference workshop presenter and track leader for the AACC international conferences. She was granted the designation as a Board Certified Professional Christian Counselor by the International Board of Christian Counselors. Lynette is the President of CounselCare Connection, P.C. and the Anger Management Institute. Mrs. Hoy oversees, authors and publishes all courses and training curriculum for both the Anger Management Institute and CounselCare Connection, P.C. Lynette was designated an Anger Management Specialist-V by the National Anger Management Association (NAMA) granting her the authority to certify Anger Management Trainers & Specialists (I-IV) through NAMA. Mrs. Hoy co-founded CounselCare Connection, an organization providing counseling services and resources for individuals and couples dealing with various issues. Lynette is a Critical Incident Stress Management provider, and a crisis counselor with the R-3 Continuum — Crisis Care Network providing counseling and debriefing to various companies. Mrs. Hoy completed 111 hours of the GPSS Leadership Coach Training Program April, 2016. Lynette completed the 15 CE program in Anger Management for counselors offered by the American Counseling Association and the 15 CE course at the Cape Cod Institute: Therapeutic Approaches to Anger by Dr. Ron Potter-Efron. Mrs. Hoy presents the Anger Management Institute Trainer’s conferences & workshops which have been granted approval in 2006-2017 by NBCC – National Board for Certified Counselors – to award 12 CEs. The 2009 -2019 Trainer & Specialist Certification workshops have been approved for 12 CEs by the National Association of Social Workers. These workshops have been approved by IAODAPCA for 13 CEUs for licensed professionals and counselors in the state of Illinois. Co-author of all four editions of What’s Good About Anger? Mrs. Hoy has trained hundreds of students and clients in anger and conflict management and has certified hundreds of leaders thourghout the USA and Canada as Trainers in Anger Management. She has authored various expanded workbooks, training manuals and articles in anger management. Lynette is a Domestic Violence Advocate having taken the approved Domestic Violence 40-Hour Training program with the Chicago Metropolitan Battered Women’s Network. Lynette writes for the Godly Business Woman, American Association of Christian Counselors and other publications and has been interviewed on various radio programs and televised on Primary Focus. Lynette is a seminar presenter for AACC, Rapha, business, community, church and women’s groups! Lynette and her husband David have one married daughter and recently celebrated their 48th anniversary. Lynette has written for AACC publications. Contact Lynette Hoy for credit card phone orders or counseling services: 630-368-1880 or directly at: 708.341.5438. Steve Yeschek, LCSW, CAMS-IV: “AMI Director of Anger Management Coaching, Consulting, Training and Mediation”! Please contact Steve with any needs you have for on-site training, client/executive coaching, consulting, groups, assessments and educational workshops at: 708-732-3527. Is an Anger Management Specialist, Diplomate, Supervisor and Consultant with NAMA & the Anger Management Institute. Mr. Yeschek is designated an Anger Management Specialist-1V by the National Anger Management Association granting him the authority to certify Anger Management Specialists through NAMA. Steve brings years of expertise and experience in training, coaching and counseling clients and groups in anger, addictions, mood and behavioral disorders and relationships issues.Steve has been the Director of the Chicagoland Rapha Treatment Centers and is an ordained Pastor . Steve is co-founder and Vice-President of CounselCare Connection, P.C. and co-presenter of the anger management Trainer-Specialist certification workshops. He has been trained in coaching and now trains others in coaching skills. Steve holds membership with the NASW, CAPS and AACC professional counseling organizations. Steve has presented various seminars and classes on crisis counseling & referral, substance abuse, self-worth, shame, codependency, marriage, family, personal growth and relationship topics to Rapha, Sunday School Associations, Cook County Employee Assistance Program, Channel 38 counselors, substance abuse agencies and various other groups and organizations over the years. Steve practices out of the CounselCare Connection, P.C.-Anger Management Institute office location at: 1200 Harger Rd., Suite 602, Oak Brook, IL 60523; and Yeschek and Associates, 2615 Three Oaks Rd., Suite 2A, Cary, IL. Contact Steve Yeschek directly at: 708-732-3527. Mr. Cannon is a Licensed Clinical Professional Counselor and Certified Addictions Counselor, providing private, outpatient mental health and addiction counseling to individuals, couples and families. He is a NAMA approved Anger Management Specialist-IV. Mr. Cannon specializes in clients with problems with pathological gambling addictions. He also provides training and consultation to therapists and agencies. Mr. Cannon has served on various quality assurance and behavioral health education committees. He directed the Addiction Counseling Education Department at Montay College in Chicago, IL. He has coordinated and provided education in Addictions at the University of St. Francis in Joliet, IL. Mr. Cannon has an M.S. degree in Psychology with Clinical Emphasis from the University of Wisconsin-Oshkosh, Oshkosh, WI. Contact Glen at: 630-253-1552. Is the Administrator for the Anger Management Institute. 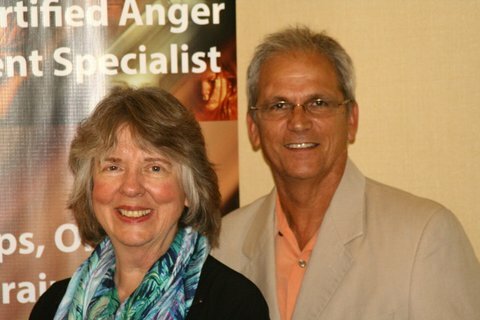 JoAnn is a Certified Anger Management Specialist-II with the National Anger Management Association. JoAnn brings her expertise as a small business owner, ability to coordinate projects and care for client needs. JoAnn’s background includes administration of professional certifications and providing student assessments at the college level. JoAnn’s responsibilities include business development and coordination of the distance-learning courses and other projects for the Anger Management Institute. Contact JoAnn at 630-368-1880, ext. 0 for questions about seminars, training and services. Is the co-author of all four editions of What’s Good About Anger?. He has recently retired as the Senior Editor of Crossway Books, a division of Good News Publishers. He has authored numerous gospel tracts, including the best-selling You’re Special and is working on several books. He is a seminar presenter, an adult Sunday School teacher and is a member of Calvary Memorial Church where he has served as an elder. He and his wife, Lois (deceased) were married for over 45 years and have two grown children and three grandchildren. Having grown up under an alcoholic father, he has personally struggled with and has extensively studied anger issues. Mr. Darling is a Licensed Clinical Social Worker and Certified Behavior Management Specialist providing treatment planning and stress reduction counseling for individuals with intellectual disabilities and other cognitive disorders. Mr. Darling has been certified by NAMA as an Anger Management Specialist-IV. He holds a Master’s Degree from the University of Chicago, School of Social Service Administration where he focused on clinical treatment. Mr. Darling’s current focus is the adaptation of technology to enhance the effectiveness of stress reduction interventions. His practice includes development of behavioral intervention strategies, and tailoring technology support systems to the unique needs of each individual. He is the past president of a successful startup company providing web-based telecare and telehealth services to people with intellectual disabilities and seniors. He conceptualized this new service and authored a related patent. He simultaneously served for many years as president and CEO of a community rehabilitation organization in Indiana. LEADER’S CERTIFICATION, INDIVIDUAL CLASSES, RESOURCES and TRAINING. Obtain certification as an Anger Management Specialist-1 or II by taking the Online Trainer-Specialist Certification Course with video (fastest way). Provides 12 NBCC and IAODAPCA CEs/CEUs or order the DVD home-study program! Our DVD program provides 15 NBCC CEs and 12 IAODAPCA CEUs. Oak Brook, IL, September 5-6, 2019. Obtain certification as an Anger Management Specialist-I or II. Approved for 12 NBCC CE hours, NAADAC, NASW CEUs and 13 IAODAPCA & NAMA CEUs. Enrollment open. Plano, TX: March, 2019 training for Anger Management Specialist I or II to be offered! Anger Management Group – six sessions – Mondays, 7:30-9 p.m. in the Oak Brook office. Do you need to develop anger management skills for personal growth and/or to enhance your relationships or marriage? Location: Oak Brook, IL. Call Lynette Hoy at 708.341.5438. Are you mandated to take an anger management program by a court or employer or school? Our programs are approved by the Circuit Court of Cook County and other court jurisdictions. Enrollment letters and certificates of completion provided. Seeing Red: Best Anger Management Practices by Lynette Hoy, NCC, LCPC, CAMS-V and Seigel Bartley, PhD, LCPC-S, CAMS-V at the Breaking the Chains AACC conference in Opryland, Sept. 27, 2017. Motivating Couples to Work through Anger to Heartfelt Forgiveness by Lynette Hoy, NCC, LCPC, CAMS-V and Seigel Bartley, PhD, LCPC-S, CAMS-V at the Breaking the Chains AACC conference in Opryland, Sept. 29, 2017. Defusing Anger and Hostility seminar by Lynette Hoy, NCC, LCPC, CAMS-V at Cook County Circuit Court Marriage and Family Services office: 69 W. Washington, Chicago, IL. Anger Management Trainer-Specialist Certification Workshops. Faith Christian Center staff, Jacksonville, FL. Lynette Hoy, NCC, LCPC, CAMS-V.
Lynette Hoy, NCC, LCPC, CAMS-V speaking engagements: How to Defuse Hostile Customers– April 2nd at Office of Adjudication in Oak Park, IL. Monday Anger Management Classes begin – for individuals & couples desiring to build effective skills. 7:30-9 p.m. 1200 Harger Rd., Suite 602, Oak Brook, IL. Enrollment letters and certificates provided for court-mandates. Oak Brook, IL. February 22nd, 1:30 – 3:00 p.m. ‘A Christian Perspective of Anger Management’ workshop: Lynette J. Hoy, NCC, LCPC. Location: Chinese Bible Church of Oak Park. February 27-28: Couple’s Conference at Christ Church of Oak Brook. Lynette J. Hoy, NCC, LCPC – one of the presenters – speaks on “Letting Forgiveness In”. Anger Managment Classes: April – May: 9 a.m.-12 p.m. workshops for individuals and couples. What are triggers for anger? What is the difference between harmful and good anger? Gain insight into anger and steps for transforming it! Someone who has been trained and completed successfully an approved program by the National Anger Management Association. The Anger Management Institute programs have been approved and endorsed by NAMA for the credential: Certified Anger Management Specialist-I. Certified Anger Management Specialists have been recognized nationally by courts, institutions, authorities and employers to provide educational classes/groups and anger management services to the public. Workshop participants may apply for *NAMA membership and this credential immediately following completion. Home-study participants must complete the course successfully and fulfill phone supervision requirements. *NAMA membership fee extra with home-study programs. 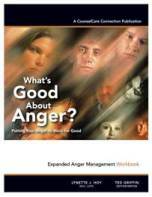 Expanded Anger Management Book and Workbook (2016) for a general readership. Now includes over 16 lessons covering the best anger management strategies from the third edition book; questions and practical scenarios for real life application. This expanded workbook includes: practical tools, “what if?” real life situations; assertiveness examples; cognitive strategies and positive skills for personal and relational change. Order the expanded workbook now! Or order the new Leader’s 16 lesson/week Group Curriculum Can be adapted for 8-12 week groups! The following is a synopsis of the first edition of What’s Good About Anger? : with application devotionals. This book is written with a strong Christian emphasis. Most people believe that anger is a negative emotion from which no good can come. Many Christians think that anger should not be expressed and that such feelings are sinful. This book explores the emotion of anger and how anger-which is part of the human experience-is a force God can use for His purposes. The authors present a biblical approach to managing anger, identifying the process of anger; biblical examples of “good anger”; and how faith, assertiveness, problem-solving and forgiveness impact anger and can be used by God for his purposes. You can order the Anger Management Trainer’s program – Faith version! Go to the Shopping Mall! You, your family, friends and clients will gain a new perspective on anger, how to let God control you when it flares up and how to understand and help others struggling with their anger. This expanded book written for a general readership, develops and emphasizes effective and practical skills for managing anger and putting anger to work for good! The authors expand on the physiology of anger and present proven, research-based approaches for managing anger through: identification of triggers, stress management, relaxation skills, problem-solving, assertiveness, conflict management, empathy. Includes chapters on forgiveness, emotional intelligence and challenging false beliefs and thinking with some spiritual insights. This edition includes a new Foreword by Dr. Richard Pfeiffer – the President of the National Anger Management Association, a chapter on the key role emotional intelligence plays in controlling anger and FAQs. Go to the Shopping Mall!